The Open Door Classroom: Election Connection Linky Party! Is it just me or are you tired of all the election campaign ads, phone calls, and mail? I guess it's that time of year, though, and the election is just around the corner. I'm so excited to be hosting my very first linky party and I hope you can join in! 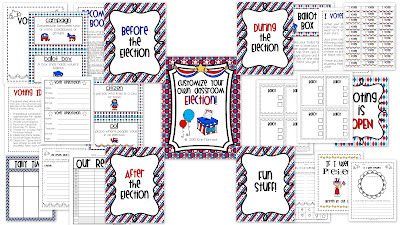 The Election Connection linky party helps hook you up with products and ideas for teaching about elections and our great country in your classroom. The unit that I created and am using for teaching elections this year is called "Customize Your Own Classroom Election!" This unit allows you to create your own classroom election about a topic of your choosing. Editable documents included are ballots, tally charts, and graphs. Also included are voter registration cards, campaign posters, ballot box ideas, and much more. To check it out, just click on the image below! Down at the bottom of the page there's a comments section. If you ever have another linky party please share it and I'll post it! Just joined in! WOO HOO! Thanks for the linky, awesome resources! I just added a link but could you change my the title to say Future Voter Buttons instead of Rhonda..thanks for this link..it is great and I hope someone likes my buttons for all those future voters to wear this week.